The popular design book Fashion House is back - now in a gifty, small format! Fashion House is a collection of beautifully illustrated interiors depicting inspirational interior design and how these can be achieved. It will inspire and delight anyone with a love of fashion, a penchant for interior design or an appreciate for beautiful illustration. Ever dreamed you could live in the suite of a Manhattan socialite? Or the grand estate of one of London's men-about-town, or a Parisian vintage loft? Within the sumptuously illustrated pages of this book you will find that all of your extravagant dreams of interior design have come true. 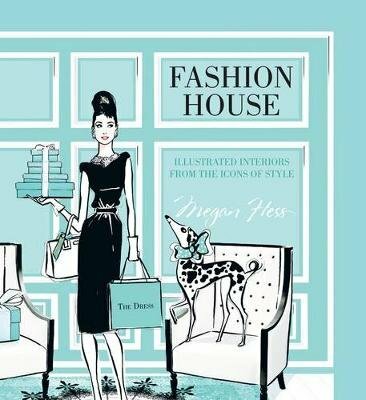 Internationally acclaimed illustrator Megan Hess has assembled some of the most decadent and indulgent interior designs from around the world in this collection, Fashion House - beautiful interiors which are guaranteed to delight and inspire. Drawn on her years of experience working as an illustrator for internationl brands such as Tiffanys, Chanel and Christian Dior, Hess has combined her love of interior design with her signature illustrations to create a book which both celebrates style and offers advice on how we can achieve it. With suggestions ranging from using patterns and fabrics on wallpaper and upholstery to the benefits of the eclectic chair, this book celebrates the icons of interior and fashion design, past and present.